Unfortunately, there have been many incidents and stories about very strict dress codes in school, even when they make little sense. This latest story about Vegas, an 11-year-old girl from Billings, Montana, is a perfect example of how a school dress code can be absolutely ridiculous. According to the Lockwood Elementary & Eileen Johnson Middle School, the girl’s dress was deemed too “distracting” for picture day. Officials from her school told Vegas that she had to change her dress, even though she was quite excited to wear it – especially because it was a present from her sister. In some situations, there’s definitely room for debate on whether or not a dress code should be properly enforced, but most people would think that there is nothing wrong at all with the outfit Vegas wore to school. She wore a beautiful gray dress with flowers on it and simple black leggings. The length of the dress doesn’t seem to be an issue, but according to the school’s policy, bare shoulders aren’t allowed. That was primarily the reason why one of the school officials instructed her to wear something else, causing Vegas to be understandably upset and sad. When her grandmother Sandra Lynn Beeler Darling heard about the story, she decided to post a heartfelt message and photo on her Facebook page where you can see Vegas in tears after they told her to change her outfit. “My beautiful granddaughter Vegas got dress coded today, her sister bought her this dress and they told her to change it because it was distracting. 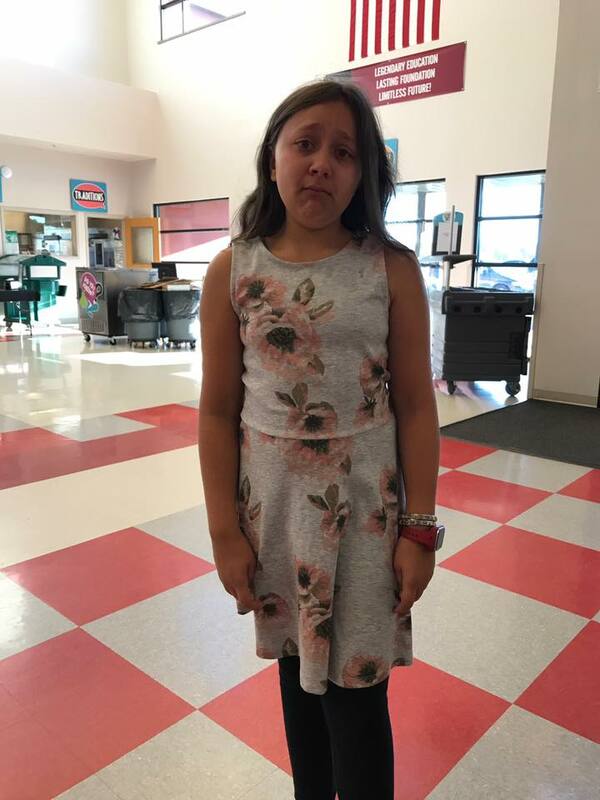 (…) It was picture day and she wanted to look cute, she is 11, if you or your kids think it is distracting, don’t look at her,” Sandra posted on her profile. It didn’t take long before Sandra’s Facebook post went viral. The photograph and Sandra’s caption have been shared over two thousand times with tons of people expressing their support in the comments. “I don’t understand why this dress would be distracting. AND it’s well below her fingertips. That’s ridiculous. I would argue this as a parent,” Meghan Hoskins wrote. “OMG! That’s ridiculous! She looks beautiful. If she’s distracting it’s due to her looking nice,” commenter Donna Lang said beautifully. Mellisa Armington then explained the absurd school policy at Lockwood: “The board put in some ridiculous policy that their shoulders cannot show. Next article Mom Takes Son Out For Lunch. When The Waiter Hears Him Stutter, He Writes Her A Note That Brings Her To Tears.